Having a decent sized kitchen trash can is a must if you’ve got a large family or just accumulate a lot of trash. Kitchen trash cans don’t have to be used only for trash though as they’re also great for recycling. Though you’ll probably want more than one in the kitchen to save yourself the pain of dividing the trash later! 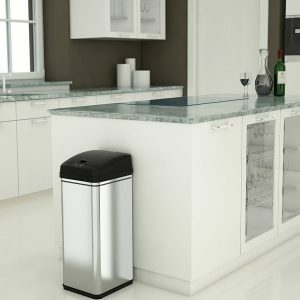 We’ve put together this guide to help you find the best kitchen trash can for your home and will point out the best features to look out for. We’ll also give you our top picks for the best kitchen trash cans! 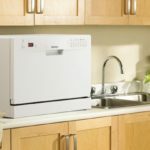 Looking for the perfect kitchen trash can for your home can take some time, but if you’re looking for a fast recommendation look no further. We highly recommend the iTouchless automatic sensor trash can as it is one of Amazon’s best sellers at the time of writing. But this isn’t the only assurance available. The trash can also has a decent price, large capacity and tonnes of useful features. 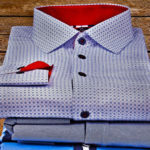 If you would like to check this product out straight away please click the link here to find out more information. In this buyer’s guide, we’ll be going over some important features to look out for when choosing the best trash can. Making sure you choose the perfect kitchen trash can size for your kitchen is important. You need to think about what space you’ve available and whether a slimmer compact or larger round trash can is better. The slimmer versions are tailored very well to slide into smaller spaces and can be hidden from view if you don’t accumulate a lot of trash. However, if you have the space available a larger one might be more convenient. If you have a large family or accumulate a lot of trash then a larger kitchen trash can is much more suitable. It’ll help you avoid having to constantly swap out the trash bags. Using a smaller or slimmer trash can will be useful for smaller kitchens or if you have a small family and don’t fill up the trash can often. There are a few things you should check for before purchasing your kitchen trash can. Making sure there’s affordable trash can liners available online at Amazon.com will help greatly if you’re on a budget. Remember that trash cans don’t have to be used just for trash, they can be used for sorting packaging and containers for recycling. The most hygienic trash cans will have either a pedal to lift the lid hands-free or automatic sensor technology. Depending on what model and material the kitchen trash is made from can have an affect how long it’ll last throughout the years. If you purchase a trash can with a plastic pedal it’s not going to last as long as one with a metal pedal. So making sure your trash can has a decent warranty gives you peace of mind. 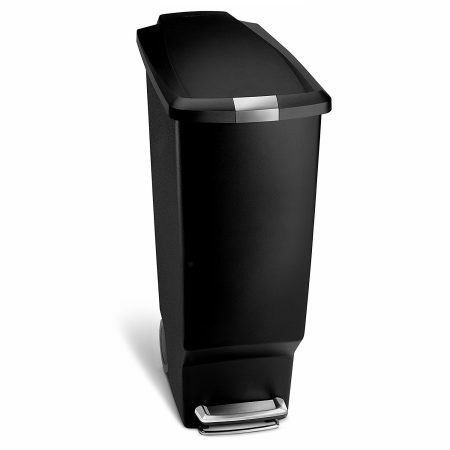 The BestOffice touch-free sensor kitchen trash can is a great choice. It’s got a large capacity which is 13 gallons, fingerprint-resistant brushed stainless steel and a sensor that allows touch-free use. It also has an open/close button for when the feature is turned off. The only drawback of this trash can is that you’ll need to purchase batteries for the touch-free sensor to work. At an affordable price for decent quality this trash can, which is also hygienic and stylish, is highly recommended by us. It’s tall and not too wide so should you have no trouble fitting into most kitchens. This Simplehuman slim kitchen trash can is perfect for smaller sized kitchens and has an amazing 5-year warranty. 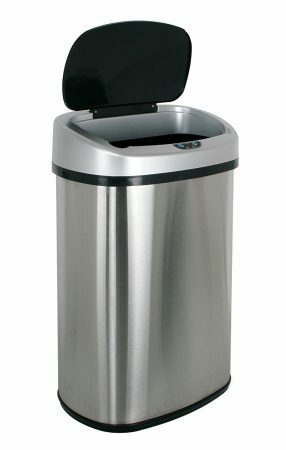 It’s got some great features which really make this kitchen trash can stand out from most other slim trash cans. It’s got a silent lid close, built-in wheels, a sturdy pedal and best of all a fairly decent 10.6-gallon capacity. 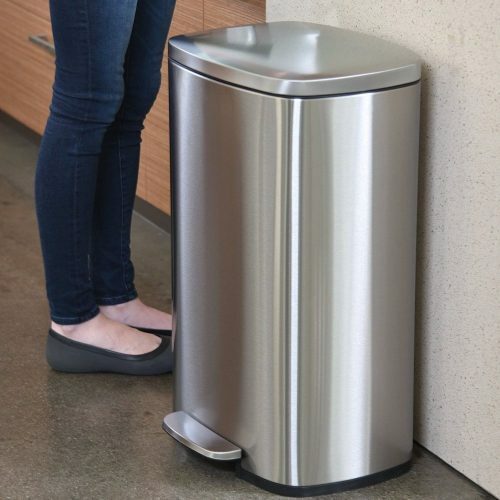 We highly recommend this Simplehuman slim trash can to anyone who has a smaller kitchen and struggles to find a spot for their trash can. It also serves a second purpose as having a few of these makes organizing your recycled items a breeze. 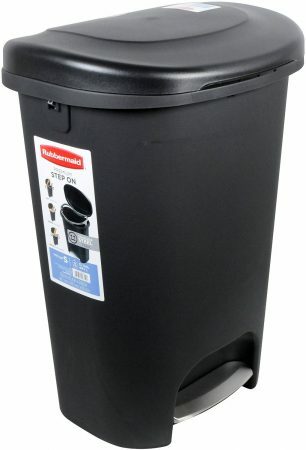 The Rubbermaid kitchen trash can is one of the best kitchen trash cans you can buy if you have a large family. It’s got a capacity of 13-gallons, has a large design to hold even more trash, cleans easy and is very durable. Impressively, it also has an innovative trash can mechanism which allows the lid to stay open without the need to keep holding the pedal down. Which is great if you need to move a lot of items. This Rubbermaid trash can is a clear choice for larger households and has a taller design so it can fit into smaller spaces. The only negative would be it’s not very sturdy if placed on a hard floor, so we recommend having a rug or carpet down to keep it in place. 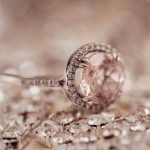 Being one of Amazon’s best sellers you can expect a lot of features. The iTouchless kitchen trash can is affordable and has a lot of useful features. It uses automatic sensors to keep it very hygienic, has an extra wide opening and comes with a modern look and feel. It’s antimicrobial, fingerprint-proof, easy to clean with a sleek stainless steel finish. Having a capacity of 13-gallons allows it to hold a lot of trash and will fit all brands kitchen trash bags making it universal. 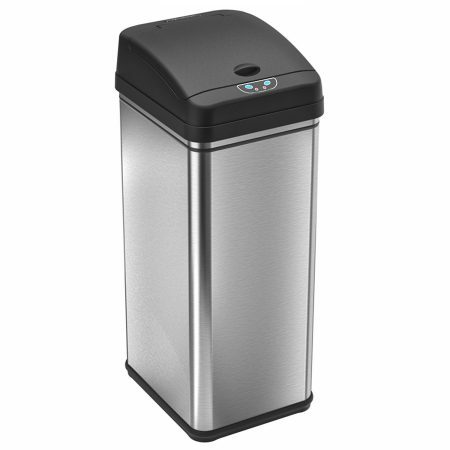 Overall we were very impressed by all the features of the iTouchless Automatic trash can. It keeps your kitchen germ and odor free and is very pleasing to look at. The only drawback would be that you have to purchase the AC adapter separately in order to use the touchless feature and get the most out of it. We hope you’ve enjoyed reading our best kitchen trash can guide and that you’ve managed to find one for your kitchen. However, if you didn’t see any that would suit you please take a look at Amazon’s best seller’s list here to find one for you. Having a modern style kitchen trash can helps keep your home germ/odor free and can add that little bit extra to your kitchen.